Patient monitoring systems have been around since the inception of modern healthcare facilities in the post-war period. The new integrated solutions that we see in the market now are manifestations of the core principle behind the operation—an eye out for vital signs, and alerts when these signs transgress the permissible limits. Nevertheless, the same technology has been re-invented over the years in a variety of ways, in a joint effort to add newer capabilities to healthcare providers and other stakeholders around the patient. Today we see a stark difference in the way different monitoring devices communicate with each other. Earlier, there were separate instruments for measurement of ECG, blood pressure, brain activity, and other crucial medical areas of interest, and each needed to be operated individually. Patient monitoring solutions are now smart and integrated, with a high-touch approach for meshing hardware that are operated and monitored by the same interface. Sensors have a higher value of precision and the geographical area of data collaboration has expanded with cloud technology. Artificial intelligence and analytical capabilities empower automation in conversion of raw patient vital signs data into useful insights and alert triggers. With the ever changing regulatory landscape of healthcare compelling providers to put more emphasis on EHRs and EMRs, the market is ripe for innovation in the aforementioned areas. 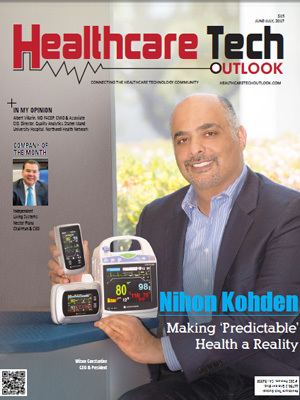 In the last few months, a distinguished panel comprising of CEOs, CIOs and analysts, along with Healthcare Tech Outlook’s editorial board reviewed and shortlisted the top companies that are at the forefront of delivering turnkey Patient Monitoring solutions. We present to you Healthcare Tech Outlook’s “10 Most Promising Patient Monitoring Solution Providers 2017,” featuring the companies that are redefining healthcare service delivery for all the stakeholders.